Kids under 11 go free on this guided family walking adventure at Conistonwater with HF Holidays. Explore the beautiful Lake District walking through the woods to beautiful Tarn Hows and Yew Tree Farm, once owned by Beatrix Potter; climb to the top of famous peaks – the Fairfield Horseshoe, Crinkle Crags and the Old Man of Coniston are amongst the options available and visit Grasmere and sample some of its famous gingerbread. This family walking holiday is perfect for families with shorter distances. The shorter walks allow time for activites or enjoying games in the wooded grounds of Monk Coniston where you will be staying. Holidays start from £339 for 3 nights. 4 to 7 night breaks also available. 50% discounts for children aged 11-17 and 10% off for grandparents too! Departures first week of August and October half term. Family Walking Adventure at Conistonwater – HF Holidays. 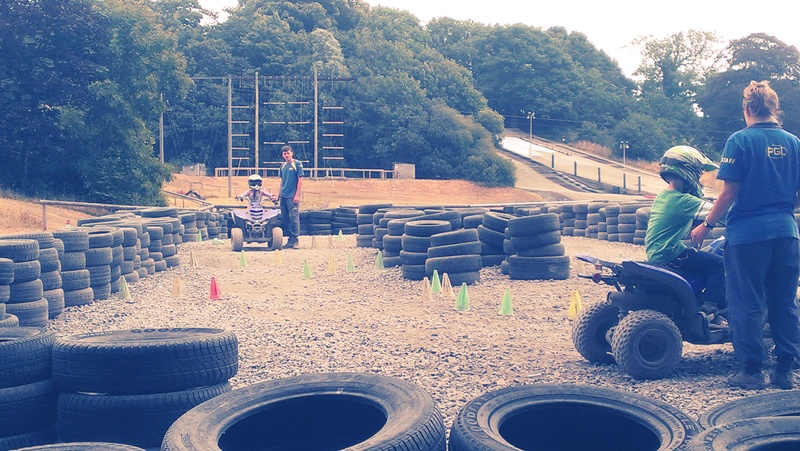 If you think your children would enjoy an Easter break participating in a range of adventure activities and making friends then a PGL residential break may be just the thing. And now is the time to book with up to 40% off when booked by midnight on Friday 27 February 2015. All breaks include simple accommodation, all meals, activities, instruction, caring supervision and evening fun. 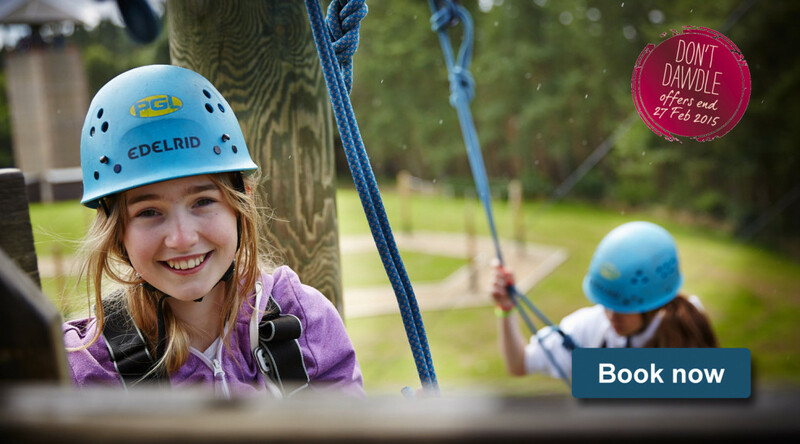 Each centre offers a slightly different range of activities, but most will include archery, canoeing, climbing, ropes courses, mountain biking and a zip wire, with virtually all activities taking place within the landscaped grounds of each centre. Other facilities may include all-weather sports pitches or activity ‘barns’. Offers for PGL Easter camps include a week starting 4 April in Sussex for £328 (was £469); in Shropshire a week is only £287 (reduced from £479) for holidays starting 28 March. In Scotland a week is now £325 (was £465) for holidays starting 4 April. When booking quote FEB7. 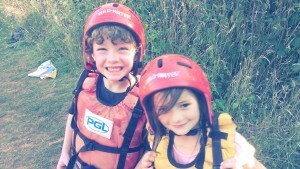 PGL’s special activity holiday insurance must be taken for each child, at a cost of £37 (for UK residents). Suitable for children aged seven to sixteen inclusive with separate age groups for 7-10s, 10-13s and 13-16s. 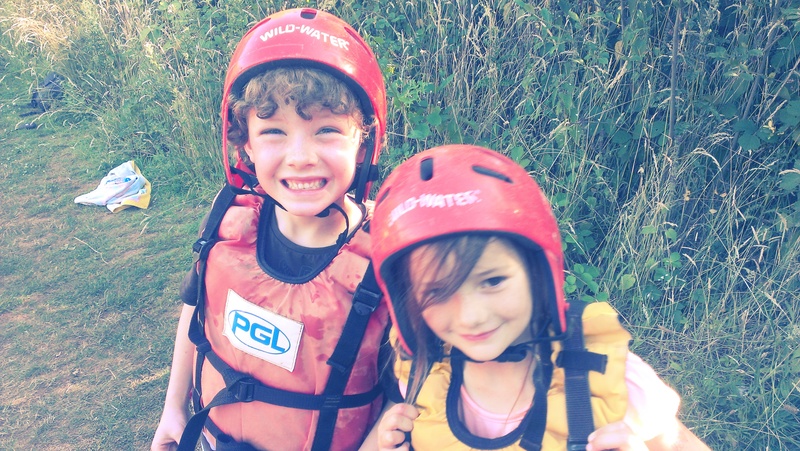 PGL Adventure Holidays – Easter Offers. Book with the Family Adventure Company and be in with a chance of winning your children’s places for free. Up to 3 children places will qualify. The Family Adventure Company has an exciting range of family holidays to choose from and with holidays specifically aimed at teenagers. Maybe you fancy a summer activity holiday in the Pyrenees or swimming with dolphins in the Azores Islands – there will be a holiday to suit your family. Simply book between now and the end of February 2015. The winner to be announced 6 March 2015. The Family Adventure Company has been named Best Escorted Tour Operator in The Times and Sunday Times Travel Awards 2014. Win your children’s holiday! | The Family Adventure Company. I love this active 5 day family Lapland adventure holiday from Families Worldwide – just the name makes me want to book. 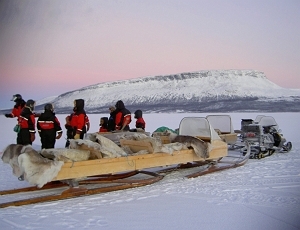 Ice-Pop is a truly unique, snow adventure beyond the Arctic Circle where the family can try snow-shoeing, go sledging and play in the snow, go on an optional husky ride and learn about the indigenous Sami people and their reindeer. Accommodation is in a comfortable Scandinavian-style hotel with sauna and views across the frozen river (4 nights). You can extend the trip with an overnight stay at the Snow Hotel in Norway (additional cost). Departures in 2015 include February half-term, Easter and Xmas. Lapland Adventure Holidays – Ice-Pop. When I told friends we were off to Spain for our summer holiday there were mentions of “lovely”, “thought it was France this year”; when I went on to say Extremadura blank expressions. To be truthful, I had absolutely no idea where Extremadura was either; it appeared to be in the middle of nowhere, a two and a half hour drive towards the Portuguese border from Madrid. 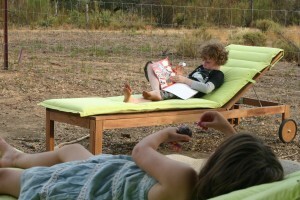 It was an eco-friendly, safari tent holiday on a sheep farm with cork oaks that had caught my eye, or perhaps it was the photograph of two contemporary, lime sun loungers in front of the tent that had really appealed. I searched for tourist attractions in Extremadura and Google promised me many wonderful sights to see. Mentions of “a remote, secret region”, “land of the Spanish conquistadors”, and “oodles of outdoor fun” was enough to get me booking. Still we left with a feeling of not really knowing what lay ahead. Our accommodation was on a finca beneath the mountain range of the Sierra de Gata, a region full of vineyards, oak groves and olive trees. 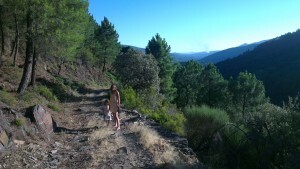 As we wound our way through low level forests towards Villabuenas de Gata my heart leapt: every village we passed appeared to have its own natural swimming pool; my son was beside himself spotting black cranes and eagles from the window, and my daughter, well she was fast asleep in the back of the car. This region of Spain is totally off the tourist path and for me this added to its appeal; somehow it felt like we were holidaying with the locals. It was hot and dry, how we like it. Our accommodation was a fully equipped, eco-friendly canvas tent set between magnificent oak trees with a beautiful vista. The kids were in their element. Upon waking they were off to collect freshly baked pastries from the owners, collecting eggs from the chickens and feeding the sheep. Daytimes were spent by the pool, and whilst we relaxed the children amused themselves playing on the swing just behind the tent, hunting for lizards, shedded snake skins and cuddling the two friendly dogs. 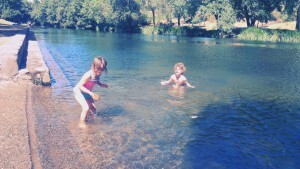 When the heat became too much, we would head to one of the local natural pools to cool off. Some were shallow enough for the children to wade with a fishing net, others were deeper offering a refreshing swim particularly those located higher in the mountains. Our favourite – Acebo Piscina Natural – we found on our second to last day; it reminded us more of a spa resort with a bar/restaurant on site and tiered lawns. To the kid’s delight we discovered ruined castles and medieval villages with bygone architecture, alleys and passageways. 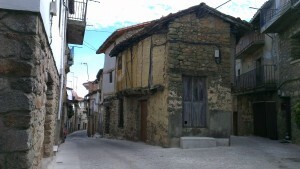 There are numerous hamlets and villages sprinkled across the Sierra de Gata and I would definitely recommend visiting the isolated moutain top village of Trevejo with its ancient stone houses. 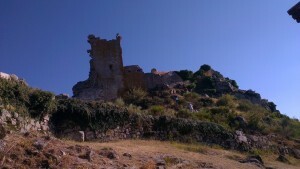 The highlight is the 15th century Templar castle perched up high and precariously leaning to one side. You need a head for heights to clamber round the ruins. 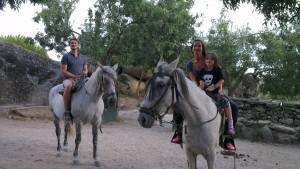 With some crazy golf and horse-riding thrown in our holiday was more than we could have hoped for, much more. If you want to experience real Spain, where you feel you are a visitor rather than a tourist then this is the place for you. Getting there and accommodation: We flew into Madrid with Easyjet. 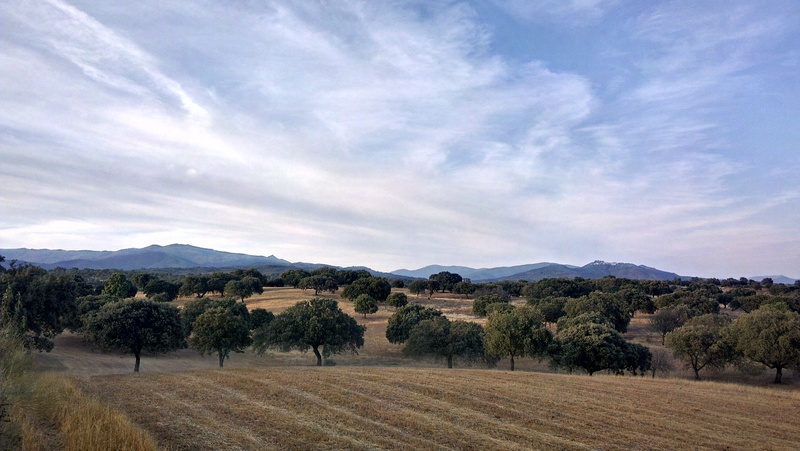 It’s a straightforward drive to Extremadura taking approximately two and a half hours. Finca las Canadas is located just outside the village of Villabuenas de Gata and offers luxury eco-safari tents perfect for a family glamping holiday. 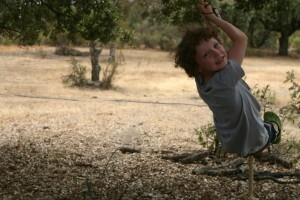 The tents sleep up to 6 and cost from 500 euros (open March to October). From 2012 bell tents will also be available. Interesting fact: “Bano de la Cochina” (Bath of the Sow) is a short walk from the finca. Legend goes that a sow with rheumatism bathed in the stagnant green water and after covering itself with mud for a few days it was cured. The bath now attracts people who are looking for the relief of their pains. 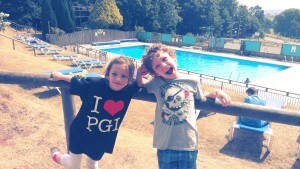 “Mumma, can I stay all summer” requests my six year old as we near the end of our PGL Family Active holiday. “And mumma, all the instructors here are cool and I want to teach the zip wire when I’m bigger”. If someone had told me before the holiday that that was how my daughter was going to feel about our 4 night multi-activity holiday I wouldn’t have believed them. 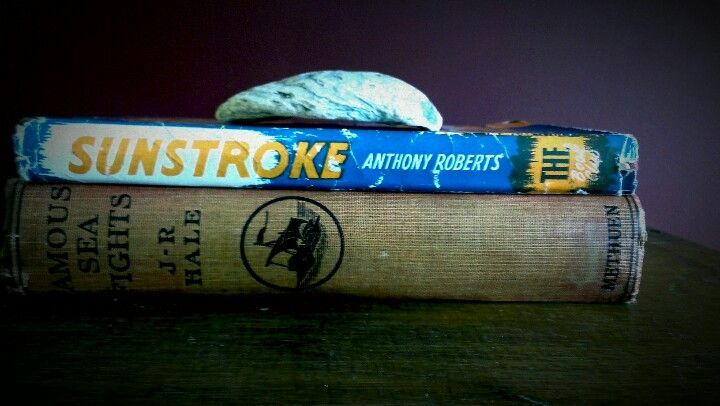 I had started the holiday with some intrepidation as I was not sure it would be suited to both my children. In the late eighties as a young teenager I was desperate to go on a PGL summer camp – I could see myself on the climbing walls, messing around in a canoe and enjoying some freedom but it never happened. Fast forward twenty five years and suddenly I find myself invited to review with my two children Jonny (7) and Gaia (6) a PGL family holiday in South Devon. Barton Hall in Torbay, Devon is PGL’s largest family-friendly centre and is set in 46 acres of the English Riviera with a huge, outdoor heated swimming pool (impossible to keep my children out of in-between activities), dry ski slope and lake for canoeing and rafting activities. On arrival we were met by a team of friendly PGL reps, shown to our accommodation, given a hand with our bags and sat down to run through our personalised itinerary for the next four days to check that we were happy with the activities planned. My heart skipped a beat or two when I read ‘vertical challenge’ and ‘survivor’ however, this was something I couldn’t show in front of the children. We spent the next four days trying 14 different types of activities or ‘challenges’ including zip wire, quad biking, a vertical challenge, open canoeing, crate challenge, archery, a challenge course, raft building, abseiling, survivor, aeroball, orienteering, climbing and problem solving. The zip wire was Gaia’s favourite activity and for Jonny it was ‘survivor’ – a combination of fire-making and shelter building. Mine turned out unexpectedly to be the ‘climbing wall’. My children liked the timetabled 2 activities in the morning, 2 activities in the afternoon with meals, ice-creams and swims in-between. The children were always encouraged if they were slightly daunted by an activity but never made to do anything they didn’t want to. Jonny and Gaia never seemed to tire and after dinner we found ourselves joining in the evening activities. Early evening games being outdoors based (think scavanger hunt, team challenges, human bingo and dance routines) and mid evening games being based in the bar area. This was a great way to socialise with the other families we had been grouped with over a relaxing drink. Plus the bar offered milkshakes, hot chocolate and fresh popcorn so always a winner with the children, plus they got to play with their new friends. PGL has been refining its activity offer since 1957 and from our experience at Barton Hall I reckon they’ve pretty much got it right. The range of activities on offer, the beautiful site, the friendliness and competence of the young PGL instructors could not be faulted. The accommodation at Barton Hall is a little dated but the room itself was clean and comfortable, with a lawned area in front where the kids could run free and play in the trees. The kids loved the bunk beds too. The holiday also taught me never to make assumptions about what your children can and can’t do. Both Jonny and Gaia amazed me with their ‘give it a go’ attitude. PGL we will be back! If you would like a taste of an African safari without having to leave the country then ZSL Whipsnade Zoo’s overnight animal encounter experience delivers just this. When the park gates close to the general public, a fully hosted event for small group of families kicks off with a welcome glass of bubbly, an evening safari truck park drive, a delicious bbq followed by a torchlit walking tour back to Lookout Lodge for a comfortable night’s sleep. And the fun doesn’t stop there. In the morning it’s back in the truck for one more tour with a few animal feedings and a cheeky chimpanzee display thrown in before the masses arrive. It was our first visit to ZSL Whipsnade, one of Europe’s largest wildlife conservation parks set on the edge of the Chiltern Downs in Bedfordshire and we will definitely be back. WIth approximately 600 acres the animals have good sized enclosures and the antelopes, white rhinos, asian elephants and zebras all enjoy huge paddocks. Australian wallabies and South American Maras (the largest relatives of the guinea pigs) all roam freely oblivious to the presence of humans and cars right by (the park is so huge that day visitors can choose to either drive or walk around). At 6.00pm our evening tour of the park started with an open-sided camouflage safari truck drive stopping for an encounter with the charismatic meerkats before moving on to admire the Zoo’s pride of lions who were slumbering in the warm, early evening sunshine a mere foot away on the other side of the viewing glass. After dinner, children and adults were equipped with torches for an hour long walk back to the camp via the flamingos and wolves. Accommodation was in wonderfully warm wooden camping pods sleeping our family of four cosily. The kids went to bed looking forward to the chimpanzee, brown bear and wolverine morning feedings. The children loved being so close to the animals and being able to ask question after question, their inquisitive minds set alight by getting to know the Zoo’s inhabitants up close and personal. My daughter’s verdict: “It was fun. I enjoyed feeding the animals and seeing the wolverines and the cheetahs. The flamingos could stand up on one leg and they eat from a barrel and it gives them their colour. Then I liked walking to see the tigers and putting my coin in and making it spin round. Mine spinned for the longest and it was really fast. When I was in the car [on the way there] I was imagining what it would be like and I liked the ice cream van. It was a Smartie ice cream and I liked my monkey I bought as I saw it in real life You could go to the fence and a lemur was sitting there but you couldn’t touch it because it was so old and it could get your germs. I liked my Lodge. It was small. I liked the sofa and I liked the drinks and I played outside with some torches and that was fun”. And my son: “It was a brilliant experience. It was great. My favourite crazy bit was seeing the chimps. My favourite animal was the wolverine. I liked it when we fed the animals. They had a load of them. When we went there they had some baby boar and the cheetahs were sleeping most of the time. We got on a truck and we saw some animals. We had a walk with some torches at nine at night and it was good as we saw the flamingos”.